Features: steering wheel audio controls to an aftermarket stereo Note: Youll usually have to hardwire this adapter into your vehicles wiring. In most vehicles, the factory radio plug does not have a wire dedicated to the steering wheel audio controls, so splicing & soldering is often required. 12 Volt DC Power Required, Maestro SW-Universal Analog Steering Wheel Interface GREAT FOR CARS, LARGE SUVs, VANS, RVs, TRUCKS, & BUSES! Whats Included: Steering wheel control interface module 24" Seven-pin harness with bare wire on other end 23" Four-pin harness with a male 3. GO TO AXXESSINTERFACES WEBSITE TO CONFIRM THIS WILL WORK ON YOUR VEHICLE. Micro “B”USB updatable. Retains balance and fade. The AX-HYKIAUSB-2 is to be used when the factoryUSB is desired to be retained for select Hyundai / Kia vehicles. GO TO AXXESSINTERFACES WEBSITE TO CONFIRM THIS WILL WORK ON YOUR VEHICLE. Optima 2014-2016. GM Wire Harness for Select 98-09 Chevy Olds Pontiac Buick. This is the Wire Harness you will need to replace the Factory Radio in most GM vehicles 98-09 without Bose or Monsoon Systems. 2004 - 2005 Century. GO TO AXXESSINTERFACES WEBSITE TO CONFIRM THIS WILL WORK ON YOUR VEHICLE. Soul 2014-2017. Sorento 2016-2017. Sedona 2015-2017. Optima 2016-2017. Forte 2017. Cadenza 2017. Veloster 2016-2017. Kenwood Car Stereo Power & Speaker Harness. For Kenwood units only. 16 pin wire harness. Car Head-unit cable Adapter. On-board 10 amp ACC 12 Volt output. You can install the ADS-MSW yourself if you have experience installing car audio gear — keep in mind that you'll have to splice into your vehicle's wiring and solder connections. Before installing, you'll program the interface at the iDatalink site to work with your particular vehicle and car stereo. It maintains the operation of OnStar in vehicles with Bose sound systems, amplified audio systems, and also audio systems without an external amplifier. The OS-5 has on-board switching that allows audio from the OnStar system to play through the two front factory speakers. Subwoofer Enclosures. 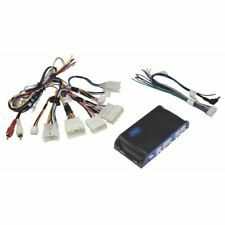 Car Stereo 4-Way Speaker Wiring Harness for Select 2011-Up Hyundai and Kia Vehicles. A pair of 4-way Speaker Connectors for Select Hyundai & Kia Vehicles. Non Car Audio Products. Axxess(R) AX-GMLAN29-SWC Data Interface with SWC for 2006 & Up GM(R) Specifications: • Provides accessory power (12V, 10A). • For use on nonamplified models or analog/digital amplified models. • Retains balance & fade (excluding digital amplified models). Main harness for ROSEN DS-HY1130 Hyundai Elantra 2011-12 . Scosche Direct Connection Harness 95-Up Nissan To Clarion 16 Pin Connect. New in the package. Direct Connection Aftermarket Stereo Wiring Harness (SMNN03CLR16B) by Scosche®, for Clarion 16-pin connectors. Up yourself and your tunes over the factory installation with top-of-the-line audio products from Scosche. Built for just about any kind of music junkies, Scosche products will help you make your audio system work at its peak, creating an incredible sound reproduction for the most enjoyable rides. Made from premier grade materials, they can withstand the rigors of daily driving and will last you for many years. Plugs Into Car Harness At Radio. For select 1999-2006 Hyundai vehicles. Harness is designed to plug in the factory radio. 1999-2008 Hyundai. Plugs into OEM Radio. 16-pin connector. Amplifier bypass harness. 2010 Hyundai. We are committed to providing you a quality product at the lowest prices possible. Hyundai H1 2010 onwards. 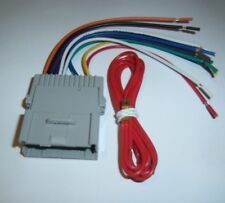 This wiring harness is required to connect an after-market stereo with standard ISO connectors to your vehicle specific wiring. ISO wiring harness adapter lead is required to connect an after-market stereo to your vehicle. Speaker Harness Adapters for select Chevrolet, Kia, Suzuki vehicles only. It is important to us that if you see our products being used in the lanes, that you have access to obtaining those products. Retains balance and fade (excluding digital amplified models). ProvidesNAV outputs (parking brake / reverse / speed sense). (3) These vehicles have a digital amp option. If Y91 is present then the vehicle is equipped with a digital amplifier. Provides a direct plug and play in to any PAC SWI Interface. Can be used if the vehicle does not have OnStar. Retains the 5.1 Digital audio system in select GM Vehicles. Retains factory Bluetooth features and functions (2009 Model Vehicles). Eliminate the need for an aftermarket Satellite Radio antenna with this Maestro HRN-ANT-SAT1 adapter, which allows you to use your factory satellite antenna with an aftermarket Satellite Radio. The SMB connector enables versatile use. Product Features Compatible with select OEM Satellite Radio antennas Using a FAKRA connector, including select Chrysler, Ford, GM and Volkswagen vehicles. Aftermarket adapter Allows you to use a factory satellite antenna with an aftermarket Satellite Radio. SMB connector For versatile use with most aftermarket Satellite Radio tuners..
Kenwood DDX319. Many other Kenwood radios are compatible and may not be listed. Kenwood DDX419. Kenwood DDX719. Kenwood DNX6190HD. Kenwood DNX6990HD. Kenwood DNX7190HD. You no longer need the SWI-JACK ! Includes HYBL-05 Interface Module, HYBL-05 harness (main-complete), 16 PIN Harness, and Pamphlet! Serial Will Vary. COMPLETE SET! (Sx2) PROFESSIONAL INSTALLATION REQUIRED! Wires may be cut short and/or altered as these are used units. Sonoma With Double-DIN Radio 2002 2003. Blazer With Double-DIN Radio 2002 2002. S-10 Pickup With Double-DIN Radio 2002 2002. Blazer 2003 2005. Prizm 2000 2003. S-10 Pickup 2003 2004. Santa Fe (with OENAV ) 2009 2009. Retains Blue Link System: The HYBL-03 interface retains your vehicle's factoryBlue Link system. Kia Sorento 2011-2013. Hyundai Tucson 2010-2012. Radio Harness. Vehicle Harness. Red 12 Volt Accessory. Can be used in non-amplified or amplified models. Solstice 2006-2009SATURN. G6 2009 (5th digit ofVIN must be a J K or L). G5 2007-2009. Malibu 2008-2012. HHR 2006-2011. Cobalt 2007-2010. Speaker harness for Toyota Vehicles. Allow the user to retain their factory speaker connectors while installing a new set of speakers without having to splice into factory wiring. It is important to us that if you see our products being used in the lanes, that you have access to obtaining those products. Includes HYBL-05 Interface Module, HYBL-05 harness (main-complete), 16 PIN Harness, and Pamphlet! Serial Will Vary. COMPLETE SET! (Sx2) PROFESSIONAL INSTALLATION REQUIRED! AXXESS AX-HYKIA1-SWC. Radio Installation Kits. Genesis Coupe (1) 2013-2016. Non Car Audio Products. Besides cost it is likely to delay the order. We do not allow pick up of orders. Self installation voids the warranty if any.